I find birthday cake and picture books irresistible. I am tempted by the decorative icing on a cake and the cover illustrations on a picture book. I savor each bite of a piece of cake and each word on a page in picture book. 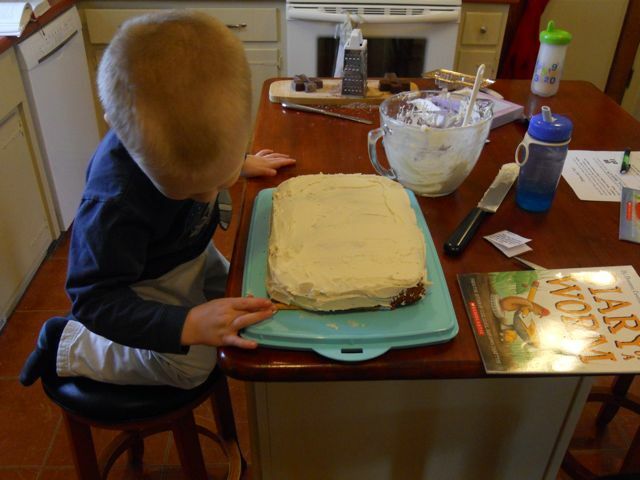 The first bite of birthday cake is as good as the last word of a great picture book. Following each, I often say, "Can I have another?" The only thing better than having birthday cake and reading a picture book would be to have them together! 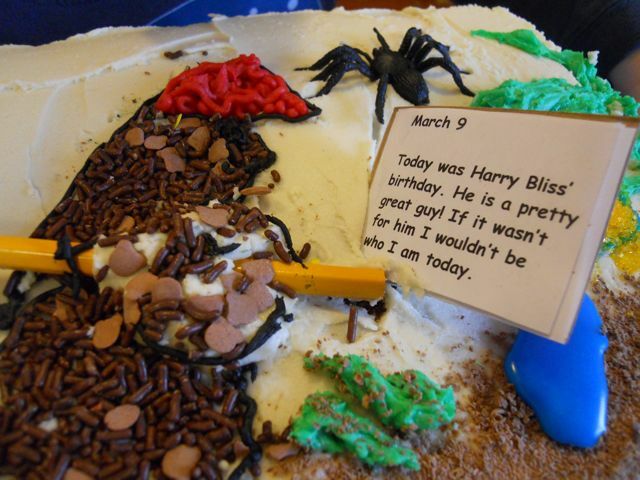 I hope you find our birthday celebration for Harry Bliss irresistible enough to try it yourselves. You may know Harry Bliss from his The NewYorker magazine covers, which he says has a 90% rejection rate. Or maybe his Bliss daily comic strip where most of his ideas come from his own life. (TitleTales). Or perhaps his picture book illustrations for great authors like Doreen Cronin, Sharon Creech, Kate DiCamillo and William Steig. He credits these collaborations for teaching him how integrate words and pictures. (CBR). I admire Bliss' ability to contribute to a picture book story through thought-bubbles, quirky labels, and funny drawings. He said in an interview with Talking Comics with Tim, "The sight gags in the backgrounds of my books came from my love of Will Elder, a brilliant Mad Magazine cartoonist who was a master at this sort of thing. I try to add as much as I can and I'm careful that the extra gags don't interfere with the central story." His first children's book was A Fine, Fine School by Sharon Creech in 2001 which became a New York Times Bestseller. (We read and reread this book for the first time this week and we highly recommend!) He found additional success with the Diary of a Worm, Diary of a Spider, and Diary of a Fly with Doreen Cronin. In an interview with TitleTales he said, "I first learned of Doreen Cronin when I stumbled across Click Clack Moo...this book knocked me out, so clever and well done. About a year later I'd met Doreen at a party in NYC and we discussed working together and a year later we teamed up." He later discusses that he signed on from the beginning to make a trilogy with Cronin. It was not a situation "where we made a lot of money off the first book and decided to make more. When I signed on for Worm, I signed on for all three books, a seven year project." Now Harry Bliss has moved into writing his own children's books with Luke on the Loose (A Toon Book) and Bailey, a book inspired by Bliss' cartoons and his own dog Penny (trailer at the end of this post). Our birthday celebration for Harry Bliss went down a familiar road -- we baked and decorated a cake. 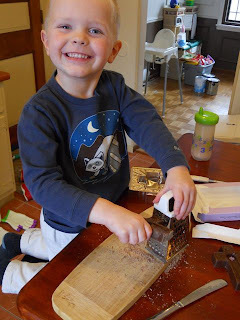 Our inspiration for this activity came by way of Zoe Toft at Playing by the Book. Her amazing children's literature blog is hosting the First Annual Edible Book Festival and there is still time to enter by March 16th, 2012. The challenge is simple -- bake and decorate a cake that is in some way inspired by a children's book, take a couple photos, and send them to Zoe (read the official rules on her blog). There will be an online gallery from March 19-23 that displays the entries. Three winners will be chosen and awarded some great prizes. 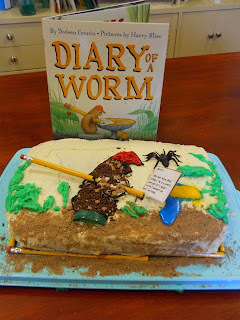 We hope that our Diary of a Worm cake inspires you to enter this awesome contest! Thank you Zoe for inspiring my son and I! My son grated a chocolate bar to make "dirt". 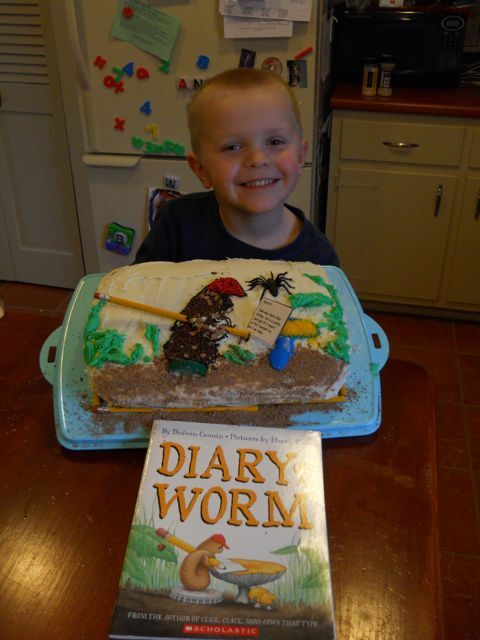 He did have to clarify, "There won't be real worms on our cake, Dad." 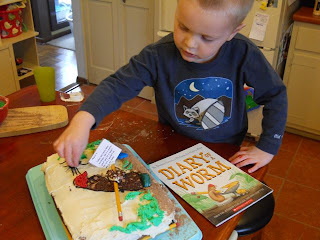 He placed pencils around the base of the cake to create a fancy border. We recreated the cover of the book with Worm writing at his mushroom desk. In this photo, my son added Worm's friend, Spider. Another masterpiece! We were challenged to create Worm out of brown sprinkles, because we ran out of frosting! Worm was writing about Harry Bliss in his diary on March 9. Did we inspire you to make your own edible book? I hope so! I had to share this photo. 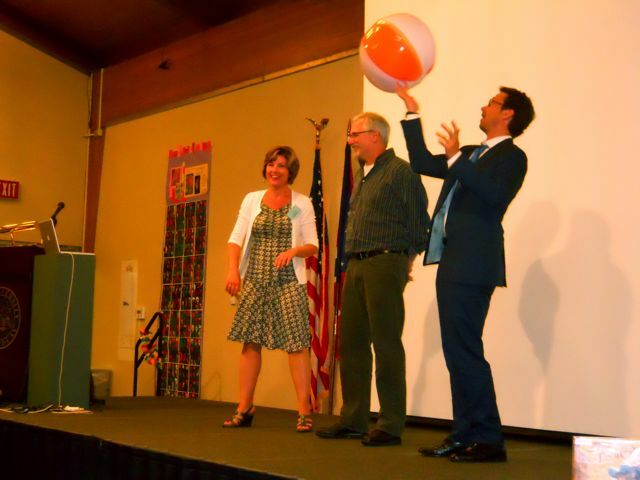 Last summer 2011, I got to hear Candace Fleming, Eric Rohmann, and Harry Bliss speak at the Mazza Museum in Findlay, Ohio. It was fabulous! My favorite quote from Harry's talk was when he was asked if he would ever create a graphic novel and he said, "It's too much work. I am far too lazy." Great to learn a little more about Harry Bliss - I only recently discovered him. And I really do love the smiles on your son's face. Looks like you had a great time together. *Thankyou* for spreading the word about the Edible Book Festival - there's still a week to enter, and everyone is most welcome to do so. No problem! It is a great contest. I wish I could have entered, but I needed to blog our experience for Bliss' birthday -- couldn't wait until March 26! I really do hope that someone enters your contest after seeing our cake! That would make my day! Great job on the cake --it looks wonderful! And young M's smile makes it even better --looks like he had a great time making it! M said, "Gail was on our blog!" He was pretty excited to know that you saw his cake! Thank you for commenting! What a fun contest to do with your kids. Your cake looks terrific! Good luck hope you guys win. I wasn't aware of the other Diary books, thanks for sharing that. I checked out the Bailey video and the homework part made me crack up a bit. Can't wait to check out all the books with the kids. Thanks Jennifer! All of the Diary books are good, but I still think Worm is the best. The pencils made it just right (or would that be write). Good luck with the competition. I need to check out those books. We love to bake at our house, but we're in the middle of a wellness challenge. Might not be a good idea for now. Our cake wouldn't be good during a wellness challenge! But, maybe you could make a banana cake! Thanks for stopping by Stacy! Wow! You and your son are quite a team! I am so impressed with ya'll's (a real word in Texas) cake decorating skills! The play sounds great. I love hearing about children's books being performed. I think it is so good for kids because they can make connections between the books and the play!